Hurricane Florence - Click on the tabs for more information. Oceanfront deck and beach access repair. The ONLY thing that can be built on the oceanside of the vegetation line is a stairway down to the beach. If they have an existing deck or walkway, it can remain and stairs can be built off of it. If their walkway was totally destroyed the farthest they can come toward the ocean is top of dune and build a stairway directly down to the beach. If the house had a deck on the oceanside that has been destroyed and it is now seaward of the vegetation line, the ONLY thing they can build is a 6x6 platform at the door level and a stairway directly to the beach. For more questions please call Jason Dail at 910-796-7221 or email at jason.dail@ncdenr.gov. This will be CLOSELY monitored for compliance over the coming months. RALEIGH, N.C. – Disaster survivors can get tips and advice on how to rebuild stronger against future storm damage at the Surf City Lowe’s in Hampstead from Dec. 10 through Dec. 28, with the exception of Christmas Day. FEMA's Hurricane Florence web page has additional important information, including information about how to register for FEMA disaster assistance. FEMA may be able to help you with temporary housing, for example, that is not covered by your NFIP flood insurance policy. It's a good idea to register with FEMA, even if you have NFIP flood insurance. There is also rumors page where FEMA is providing the facts about misleading or incorrect information you may be hearing. Concrete under homes will not be able to be replaced if seaward of the vegetation line. 5.5 Parking storage or use of major recreational equipment. For the purposes of these regulations, major recreational equipment is defined as including boats and boat trailers, recreational vehicles, pickup campers or coaches (designed to be mounted on automotive vehicles), motorized dwellings, tent trailers and the like, and cases or boxes used for transporting recreational equipment, whether occupied by such equipment or not. No major recreational equipment shall be used for living, sleeping, or housekeeping purposes unless it is located in a campground being legally operated under this ordinance or its owner has been issued a temporary use permit, as provided in this section, for use on (in the case of land-based equipment) or at (in the case of a boat) a residential lot. This provision is intended to limit living, sleeping, and/or housekeeping use of major recreational equipment to permitted campgrounds and to temporary visitors to residential homes. Beach Reopening & Rebuilding: A contractor was hired through the Town to complete a number of projects: 1. Clearing roadways of sand and debris. 2. Removing Construction & Vegetative Debris piled by residents for pick up. 3. Cleaning the Beaches of Debris and Replenishing Sand. 4. Dune Rebuilding. Due to the severe damage and the large amount of debris on the beaches, they can not give a specific date of when the beaches will reopen. The contractors explained that there are several steps involved before the beaches can reopen and it could take at least 120 days to complete. Sand being dozed off the roadways must be sifted to remove foreign objects before returning to the beach. They have already started this operation. They must also remove all of the remaining large debris from the beaches and dunes, sift and rake all of the sand to remove smaller objects, then engineered sand will be trucked onto the island to rebuild the beaches and dunes. Long term plans are also in effect to recreate the beaches as an "engineered beach" similar to Topsail Beach, where the dunes and vegetation have been successful. In recent years, Surf City has always pushed sand to rebuild dunes, but storms and natural tides take a toll on them. Debris Pickup: Crews have already began picking up debris piles and vegetation and will continue over the next couple of months. They will do several clean ups, so even if they pick up your initial pile, you can continue to set items on the curb for a later pick up. Click here to see how to lay out your debris. Debris Removal-cutoff date for debris placement will be Nov. 30th. If you have any vegetative, construction and demolition debris, white goods, and/or electronic waste, please have all of this out in the right of way prior to Nov. 30th. 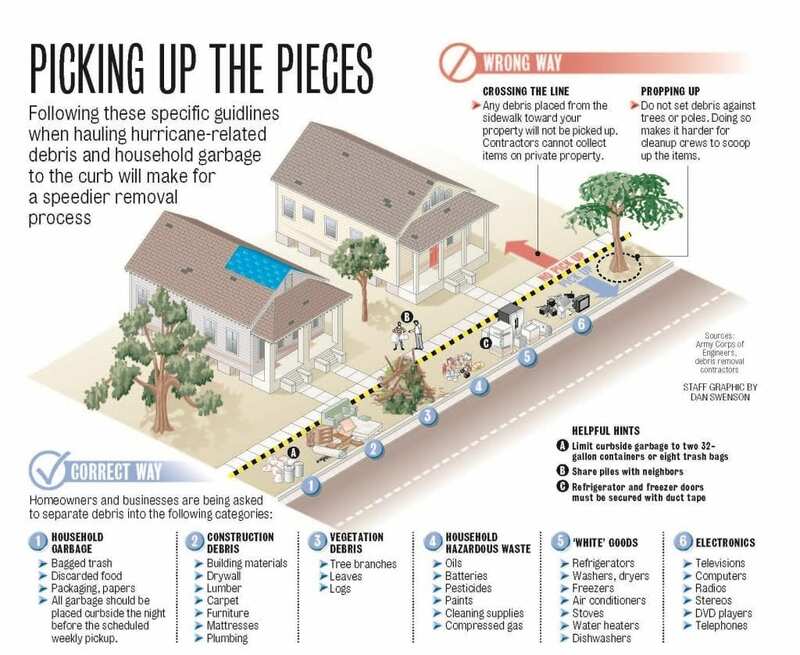 Please make sure that all debris is placed in accordance with FEMA guidelines to ensure proper collection. Please refer to the included diagram showing proper placement. Construction & Demolition (C&D) by December 21st. Please remember these are estimates and subject to change due to amounts of materials still be placed out.